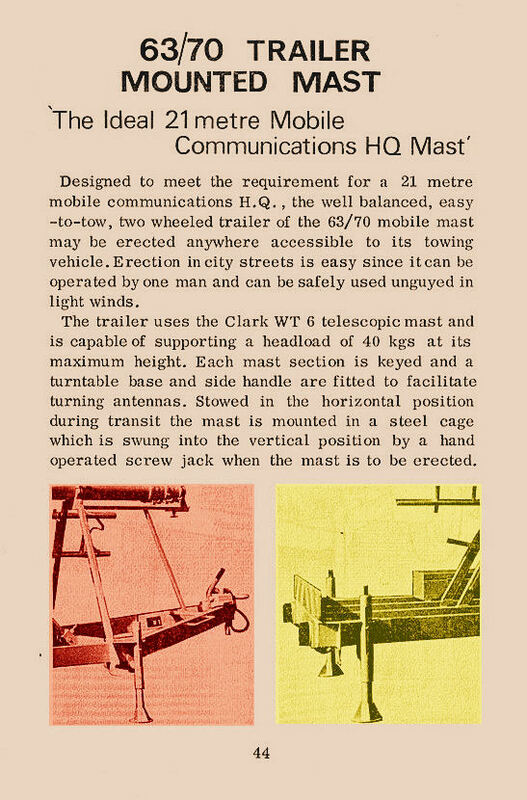 These pages depict Clark Masts original range of mast products. To see Clark's current mast series go to Portable Mast Australia Pty Ltd's (PMA's) web site. 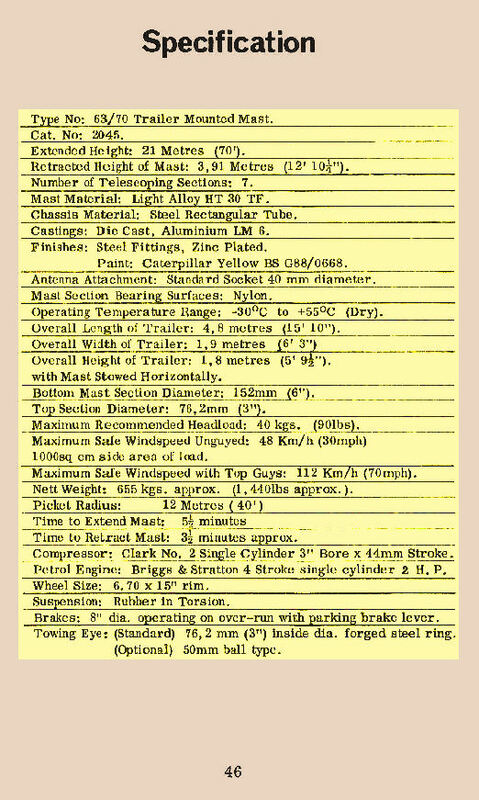 In the early 1970's Clark Masts published their first catalogue in 16 years. Alec Clark, the company's founder had been designing and building portable air-operated telescopic masts since 1957. During this time Alec Clark's unique lightweight portable masts had found their way into applications throughout the world with government Departments Of Defence, Police Departments, Fire Departments and Emergency Services. Commercial and industrial applications included for Radio Field Strength Surveying, TV Field Strength Surveying and portable radio communications. Alec Clark's company, Clark Masts Limited, performed practically ever manufacturing operation itself in-house. Fabrication, casting, precision machining, canvas sewing, plastic and rubber mouldings, anodising and plating, painting, printing, publishing and even the manufacture of packing cases were all in-house operations. Australian users first saw these unique portable masts in the early 1960's courtesy of a antenna manufacturing company called Belling-Lee and the foresight of a gentleman working for them at the time, Frank Welsh. Frank went on, with others, to form his own company, Scalar Industries, in the late 1960's and brought the Clark Masts agency with him. Following Frank Welsh's retirement from Scalar in the mid 1980's GFS Electronics took on the Australian distributorship and continued to market Clark Masts in the Australia Asia-Pacific region until the company was closed in 2011. In 2012 a new company, started by Greg Whiter, who was previously Managing Director of GFS Electronics took over the Australian distributorship of Clark Masts. That new company is Portable Masts Australia Pty Ltd. 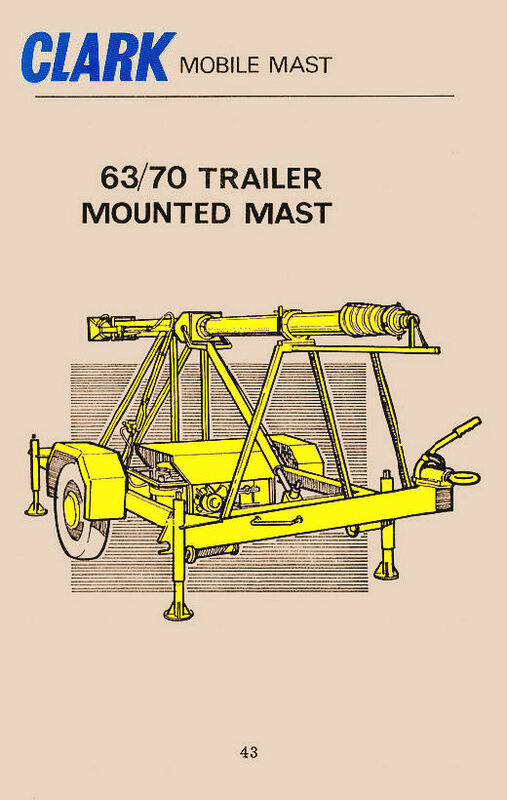 Illustrated in this web page, for historical purposes, is the 21 Metre Type 63/70 Trailer Mounted Mast page from Clark Masts early 1970's catalogue. Today's equivalent to the model 63/70 is the Model 802/21. 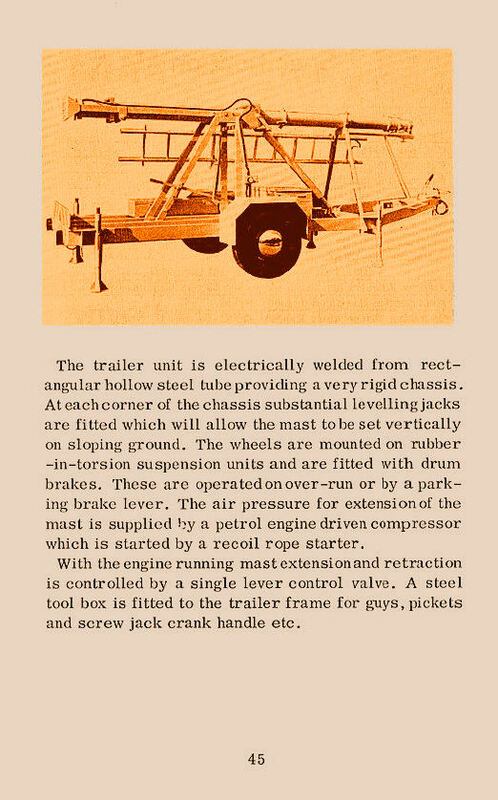 The Clark Masts Type 63/70 Trailer Mounted mast of the late 1960's - early 1970's was designed to lift heavy duty loads, using a 21 metre, 40Kg headload rated WT6 mast. The 63/70 was particularly designed to work with portable communications centres for emergency services and the like, where the mast's 40Kg headload capability could support quite a number of UHF, VHF and HF antennas simultaneously. Like all other WT Series masts the 63/70 Trailer Mast's mast sections were keyed to prevent inter-section rotation, making it suitable for use with directional headloads. The 63/70's extended height of 21 metres was obtained using 7 sections which also provided a retracted height of 3.91 metres. 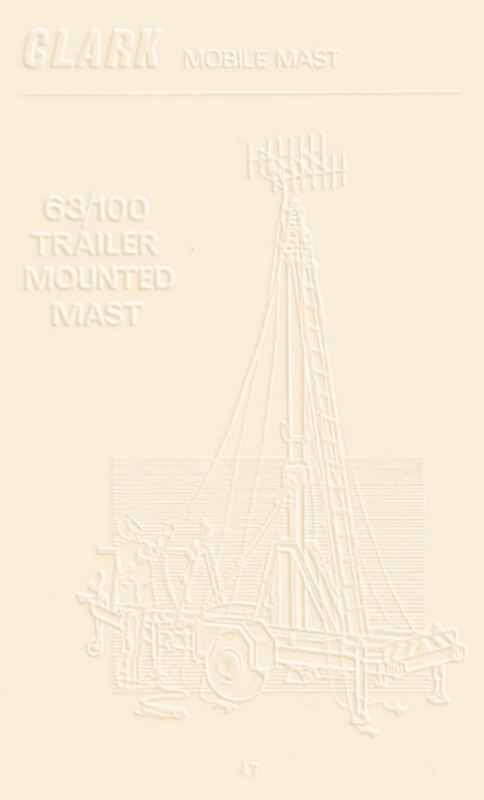 Being a WT Series mast, the 63/70 Trailer Mast's base tube diameter was 152 mm (6"). A petrol operated Compressor/Mast Controller was incorporated for mast extension/retraction and the mast was lifted into the vertical by a hand cranked screw jack. The Clark Masts type 63/70 Trailer Mast was supplied with all the components necessary for it's deployment. These included Guy Assemblies, Guy Stakes, Guy Stake Hammer, Guy Stake Location Line, Base Plate, Base Plate Spikes, Mast, Weather Cover and screw jack Crank Handle. These deployment accessories were stored in a steel tool box fitted to the trailer frame. A deployed 63/70 Trailer Mast had a wind speed rating, with 1000 square cm sail area on top into wind, of 48 km/hr un-guyed and 112 km/hr when guyed. The specified time taken to extend the mast using it's petrol compressor was 5.5 minutes. CLARK SCAMP MOPED - A slight diversion from portable mast manufacturing occurred for Alec Clark in 1967 with the design and manufacture of a small moped called the Clark "Scamp". The Scamp was developed and marketed in the United Kingdom by Alec's company AN Clark (Engineers) Limited from March to November 1968. For more details on the Clark Scamp moped see HERE. For product details and a catalogue covering over 200 different mast types of Clark Masts go to PMA's web site. All materials contained in the site www.clarkmasts.net.au/ are protected by copyright and shall not be used for any purpose other than private, non-commercial viewing purposes. Derivative works and other unauthorized copying or use of stills, audio and video footage are expressly prohibited.